Windows 7 makes traveling with your computer and using your PC for presentations a snap. With its easy-to-understand display settings, you can quickly connect a projector to your Windows 7 PC. Gone are the days of fumbling with complicated settings and interface issues. Now anyone can set up their PC to run presentations like a pro. Connect a projector device to your computer. This is usually done by plugging a VGA or DVI cable into the video port on your computer. Choose Start→Control Panel and click the Connect to a Projector link in the Hardware and Sound settings. 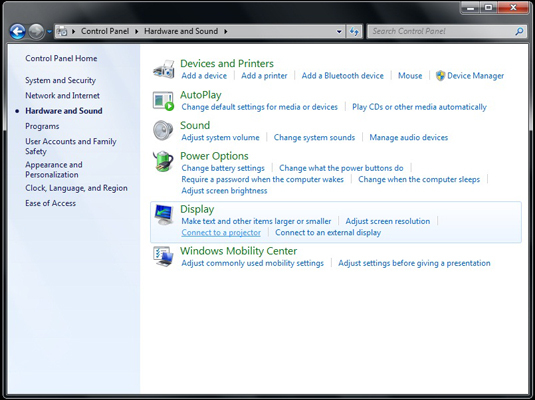 A blue panel appears with a variety of display settings. A handy shortcut to connect to a projector is to press Ctrl+Windows logo key+P. This displays the Projector settings window where you can choose how to display your desktop. Show Desktop Only On Computer Display uses your current display (on a laptop, that’s the display in the lid). Duplicate Desktop on Projector shows your desktop on both your current display and a connected projector. Extend Desktop to Projector splits the image between the two displays. This is useful for displaying your presentation on the projector while displaying your speaking notes on the PC. Show Desktop Only on Projector turns off the current display and displays the desktop only on the projector. The Projector settings window closes. The new settings take effect immediately.